MARIETTA, GA--(뉴스와이어) 2019년 01월 15일 -- Marquis Who’s Who, the world’s premier publisher of biographical profiles, is proud to present Professor Nai-Teng Yu with the Albert Nelson Marquis Lifetime Achievement Award. An accomplished listee, Professor Nai-Teng Yu celebrates many years’ experience in his professional network, and has been noted for achievements, leadership qualities, and the credentials and successes he has accrued in his field. As in all Marquis Who’s Who biographical volumes, individuals profiled are selected on the basis of current reference value. Factors such as position, noteworthy accomplishments, visibility, and prominence in a field are all taken into account during the selection process. Professor Yu holds a Bachelor’s Degree in Chemical Engineering from National Taiwan University and a Doctorate in Biophysical Chemistry from Massachusetts Institute of Technology. He completed his postdoctoral training at MIT and Harvard. He started his academic career in 1970 at Georgia Tech in Atlanta, Georgia, USA. He has been recognized as a pioneer in laser Raman spectroscopy of proteins and eye lens proteins related to cataracts. He is the inventor of a technology for diabetes screening using noninvasive fluorescence detection of AGEs from eye lens. After 20 years of teaching and research, he decided to accept the post of Founding Head of the Department of Chemistry at Hong Kong University of Science and Technology. This chemistry department was ranked No. 11 worldwide by QS World Universities Ranking 2012. 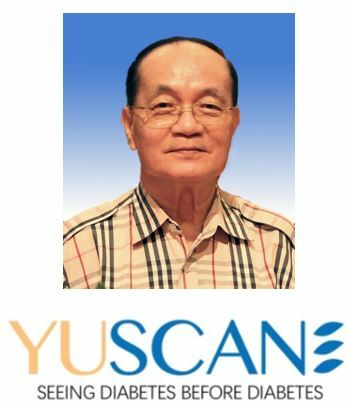 After retirement, he came back to Atlanta to co-found a diabetes-oriented company, YUSCAN USA LLC, of which he is the President and CEO. By incorporating a blue-LED light source and modern information/electronic technology, a miniaturized YUSCAN device will have the virtues of noninvasive detection of AFEs in the eye lens, handheld/self-scanned, not requiring pupil dilation and less than 5-second measurement time. This unique technology can be of great use in: self-referenced detection of pre-diabetes, classification of different stages of diabetes, and possible early detection of diabetes complications. Professor Yu held the following positions: Chief Coordinator/Representative of Germany’s Fraunhofer-IBMT in China, Adjunct Professor of Ophthalmology at Emory University Medical School, XIV ICORS International Steering Committee Chairman, Adjunct Professor of Ophthalmology of Peking Union Hospital, and Adjunct Professor of Chemistry at Peking University.